Join the group of brave Knights traveling the Kingdom of Camelot to find the legendary Holy Grail and increase your odds with Extra Magic Reel, re-triggerable Free Spins Bonus games, and more. Red Rake Gaming’s history-themed video slot machine utilizes a maximum of 6 reels, 3 rows and 5 fixed paylines helping all adventurers find the ultimate prize. Set on the quest after reading the Knights slot review. Unfortunatly, we have no free play mode for Knights available. Check out the screenshots below and hop right into action with one of the recommended casino sites! Like all modern games, this one also allows you to choose will you play for fun or for real money. The book of rules remains intact in both modes, meaning you should line up 3+ matching symbols on adjacent paylines to get paid. Moreover, those icons must be arranged from the leftmost. The Knights Free Play is enabled by default and you can use it to learn how to win without any real-money investment. This way, players can work closely on their betting strategy and implement it later when start wagering for cash. If your bankroll is strong enough to endure, try the Extra Magic Reel feature. This will add an extra reel and increase your bet finally leading to the big win. The paytable is crowded with icons from Arthurian legends, where Merlin the Wizard acts as the Wild replacing all paying symbols. Thanks to its dual nature, it also works as a Multiplier Wild doubling the line win when being a part of a winning combination. King Arthur, Percival, Lancelot, Sword in Stone, and Camelot Castle have a higher rating than standard playing cards from Tens to Aces. During the Knights Bonus, all noblemen have transformed the way to increase your winnings, as described below. 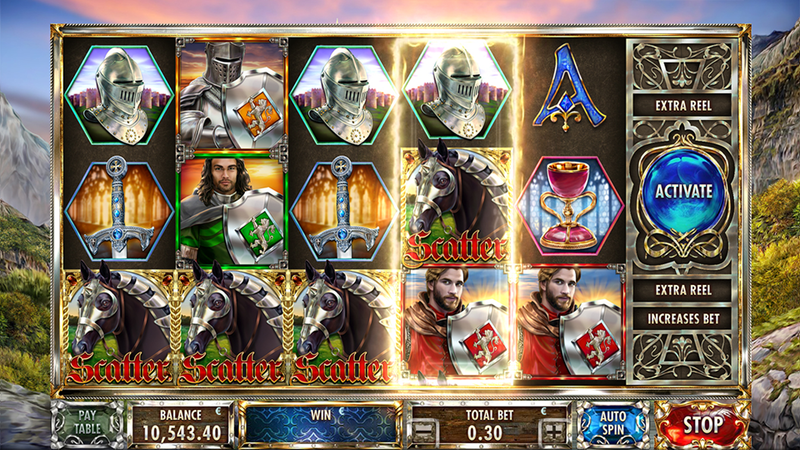 When 3+ Horse Scatters appear anywhere on the reels, you will get an initial batch of up to 40 Knights Free Spins. Another 2 Scatters grant 1 extra spins, but 3 to 6 Scatters bring a maximum of 40 additional spins. Throughout the feature, all Knights will turn into Wilds helping you form more winning combinations. 3. What is the RTP factor of Knights? Our Knights tutorial will be updated as soon as we get the official RTP info. This is a visually appealing game that also inspires you to search a bit more about Knights of the Round Table and reveal the mystery surrounding this timeless legend. Apart from a valuable history lesson, the game comes with a wide range of betting combinations and is suitable for players of all experience levels. We always suggest the newbies try the Knights tips and increase their winning odds right from the start. Who knows, maybe you’ll be the one to find the Holy Grail after so many centuries kept this powerful item in the dark.